An Eddy Covariance system (IRGASON Integrated CO2/H2O Open-Path Gas Analyser and 3D Sonic Anemometer, Campbell Scientific, Inc, Utah, USA) has been installed on the roof of a high building in the center of Heraklion (Kornarou Square). The sensor is mounted on a 10 meter telescopic mast in order to reach the appropriate height (27 m) over the urban canopy layer and measure a blended, spatially averaged signal. The system is also equipped with a CNR1 Net Radiometer (Kipp & Zonen B.V. Delft - The Netherlands) to measure incoming and outgoing shortwave and longwave radiation. 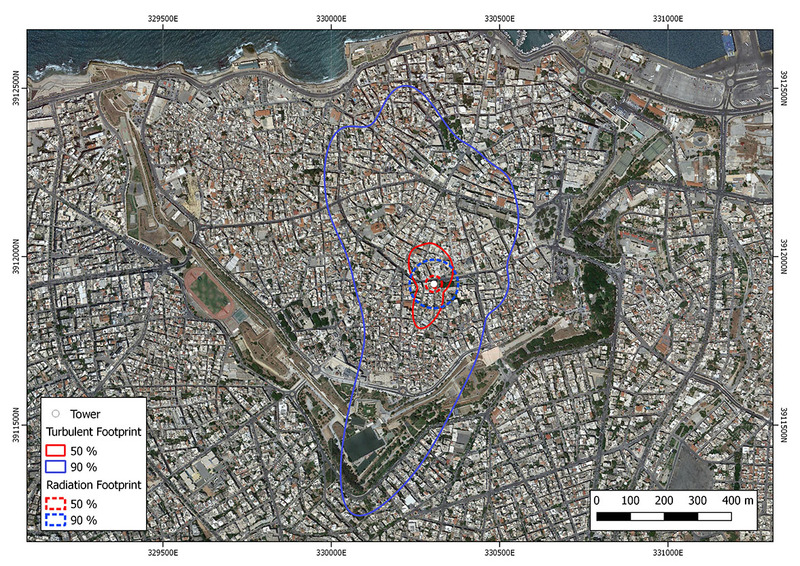 Τhe measurements are representative of a wide area around the sensor (footprint) that is estimated to cover a significant part of the city center. The Eddy Covariance method uses the turbulent transport theory in the surface layer of the atmosphere, and estimates gas and energy fluxes from the covariance between vertical wind speed and the gas concentration and temperature at a measured height above the surface. With eddy covariance, the exchange of various gases and energy between the atmosphere and the underlying surface can be measured. The installed system in Heraklion measures latent and sensible heat fluxes, as well as CO2 fluxes for the center of the city.